Before I started my sunrise/sunset series I collected a number of photos that I or my husband had taken in the last year. When sunset is approaching I step outside and look at the sky. I’ve gotten up early to catch the sun’s rising. The other day my husband and I hopped in the car after an early dinner and rushed to a spot I thought would be picturesque for the sunset. (The painting Orange Sunrise at Lake Hart is one of the photos I took that evening.) I joked that instead of being storm chasers we were sunset chasers. This series capturing those fleeting moments has caused me to reflect on how much fleeting beauty there is in our world. It’s spring and we see trees blossom into brilliant colors, only for those flowers to fall a week later. In the fall people enjoy the fall leaves, only to spend the next weekend raking and bagging up those leaves for burning or garbage. I feel a sadness as I look through photos of my family, great-grandparents, once so full of life, now are no longer with us. I’m not sure why beauty is fleeting. Maybe to make us appreciate it and live in that moment. Those fleeting moments might be a source of encouragement, a break from the ordinary to spur us to rest, and then keep going. Maybe its a hint of what’s to come. Hints of eternal paradise that we are moving towards but are not quite ready for. I really like the space in front of Orlando’s city hall. There are trees and stairs and a fountain highlighted by a metal sculpture. One morning my husband dropped me off at the corner and circled the block a few times while I took some photos. I was drawn to this angle, with the sculpture leading into the scene and the calm water of the fountain and the marble edges reflected the scene. The scene faces north looking down Orange Ave at the Grand Bohemian hotel, the CNL building, and Lincoln Plaza. I like the maze of lines formed by the steps and edge of the structures. The movement of the water reminds me of my need for change. Change can feel disruptive to my peace of mind, like the fountain moving the water might warp or obscure the reflections. However without change for the water algae would grow. For myself without change, I’m stuck, not growing. Interesting enough this fountain has enough movement to keep the water clear, and have areas that it reflects the surroundings adding to its appeal. On a number of occasions, I’d taken pictures of the buildings that make up the Plaza complex on Orange street. The building was completed in 2006 and has businesses including a movie theatre, office space, a parking garage and a tower that is residences. I found it hard to take it all in standing in front of it. It’s amazing how your view changes depending on where you are standing. I really wanted to capture the tops of the building, yet still be able to see the foundation. Time of day also influenced the scene. Trying to capture an early morning shot would mean the building was in shadows, other times you’d get too much glare from the sun. I was looking at the area with Google street view and made a discovery. You could “walk” into one of the restaurants across the street, and if you “walked outside” it gave you a night view of the Plaza. I moved it around looking at the different angles and was taken by the view seen here. The trees were strangely bare and lit from below. Lights were reflecting off the pavement and the glass of different windows. As I was thinking about this painting and the different angles and times of days I took pictures, it made me think of Monet’s Haystacks. I was surprised to learn there are over 20 paintings of the stacks made over a year or two. He was fascinated by how the season, time of day and atmosphere changed the light and colors. He worked on several paintings at a time, working for a few minutes or hours on one during certain times of the day. While we might grow bored with the familiarity and seek new experiences, Monet stuck with it. It wasn’t just about capturing form, but how color and shadow influence the form. Monet’s haystacks were shown as a collection and were a great success. They sold within days and allowing him to buy the land at Giverny and build his iconic water lily pond. I could probably do multiple paintings of the plaza and each would look markedly different. For example, in the view I chose you can’t appreciate the sculptures in front of the building. 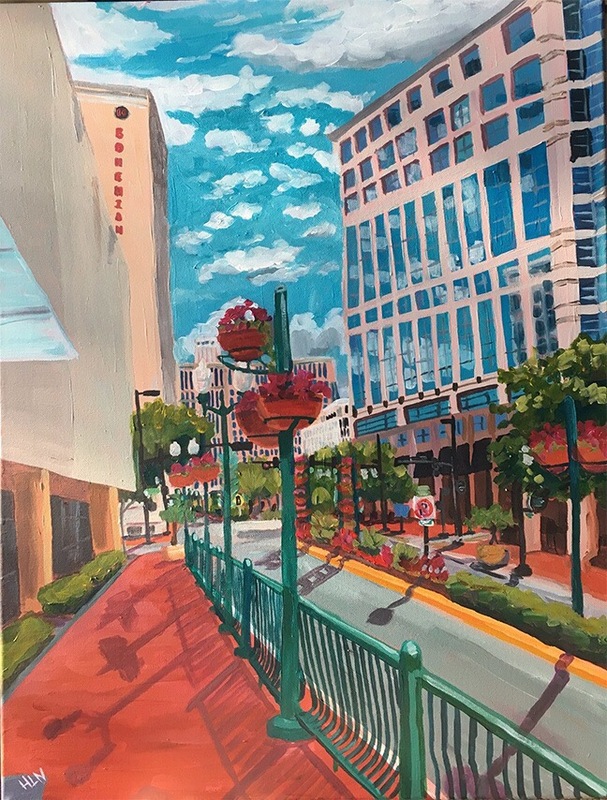 My painting Lake Eola Grand Finale shows the Solaire Plaza tower. I think it does us good to slow down and look at our life from different angles. Different seasons in life might result in new discoveries. Examining all the angles can help us see where changes need to happen. Friends and even strangers might have a different perspective, pointing out strengths to develop or weakness that can hinder us. Looking at the Church Street Station area downtown makes me think of unrealized potential. There are buildings with beautiful details, woodwork, railings, and balconies. New buildings like 55 West alongside historical markers of the Church Street train station. And yet, instead of a bustling downtown center with lots of activity, it feels like what businesses remain are barely holding on. At times this area has thrived, so it’s always the question of why some areas boom and bloom, continuing to attract people, and others age and fade. I think the same can happen with people. High school graduation, people are full of youth, potential, dreams, and idealism. A far different picture is the twentieth high school reunion–some succeed, others struggle…barely recognizable in a good or bad way. Aging well or just aging? Getting stuck or finding new ways to thrive, to learn, to forgive, to look forward. There is a bit of melancholy looking at a place with much beauty, but that’s failing to thrive. Much as there is sadness looking at a life full of potential but unable to move forward. The outward appearance is not enough, there must be an inner determination and life to sustain. At one time I’d start with a concept and try to reflect that in my work. Now I start with finding a landscape or cityscape I want to paint, and see what God might want to say to me through it. There was a call to artist for submissions that I wanted to do and realized I didn’t have any paintings I could submit. So I spend a good part of last weekend and hours this week working on three cityscapes. This is the third. The title names the intersection downtown, it’s just before you get to city hall. I love the planters and greenery downtown. I’m not fully happy with how the building on the right came out, the perspective is not quite right, which is a bit distracting. However, this building that looks more like it’s made of jello instead of metal still reflects the sky. In its imperfection, and “man-madness,” its windows reflect the beauty of the sky around it, made not by man but God. I will always have some brokenness, weakness, areas that just don’t fully line up in my life. Yet, my hope is even with my imperfections, I will reflect the perfect creator to others. Perhaps my brokenness can even serve to make sure the focus is not how great I am, but how great is the One who dwells in me.